I've been wanting an all white dress all summer, and I love this eyelet one. I thought it was different for a Lilly Pulitzer dress to have these cutouts in it, but I actually really like them! Shoutout to Sarah for not only taking these photos, for always texting me when my favorite Lilly things go on sale at her store, I got this dress for 65% off! Also, about these sunglasses. As I have dedicated a whole post to before, I love switching out my sunglasses but can't justify buying them all designer. So, Ditto Endless Eyewear is basically the best thing ever! You can rent designer sunglasses from names like Ray Ban, Prada, Karen Walker, Illesteva and more for $19 a month. But if you use my code (CARALINASTYLE) you can get your first month free! So if you really just want to try out a pair of $250+ sunglasses for a month without paying anything, I got you covered! They also have prescription glasses, free shipping both ways, and a virtual try on. It's really great if you are wondering how certain frames would look on your face. I've used the virtual try on via the Ray Ban website, and this ones is so much better, it even shows how your profile would look with the views of the sides of the glasses! Lilly Pulitzer dress | Kendra Scott earrings via my mom's RocksBox (use code "caralinastylexoxo" for your first month free! )| Kendra Scott bracelet c/o RocksBox | J. 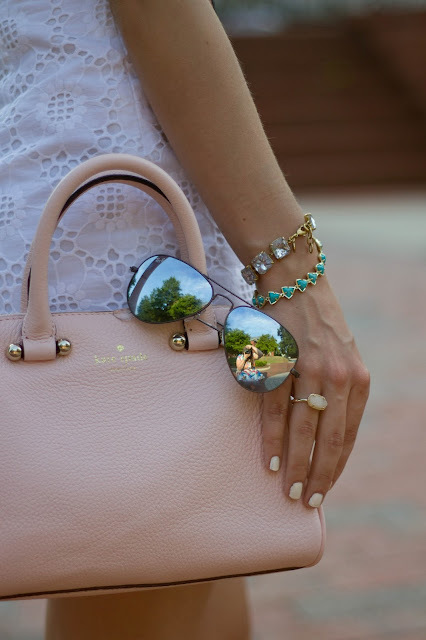 Crew bracelet (sold out, similar)| Kendra Scott ring |Very similar Kate Spade bag (mine is the outlet version) | Jack Rogers sandals (slightly different color, these are old)| Ray Ban sunglasses c/o Ditto Thanks for reading! I love eyelet dresses! This Lilly one looks fantastic on you. That blush purse is so gorgeous! love the blush and white combo! Cara this dress on you is absolutely stunning! Love the color combo too! I bought a dress like that for this summer but ended up too pregnant. I just love it! This dress looks so gorgeous on you! I love your blush Jacks! White eyelet is so gorgeous...this WOULD be a Lilly dress! I love so much! Scallop Dress + a Giveaway!